Fujifilm X-Treme is a project run by Official X-Photographers Jeff Carter of MacLean Photographic and John Rourke of Adrenal Media and they will be taking the Fujifilm X-Series and GFX cameras and lenses to the extreme in different sporting environments.Â Jeff and John are this weeks guest bloggers for Riverside Inverclyde, with their outstanding overview, pictures and videos from the P1 Scottish Grand Prix of the Sea. 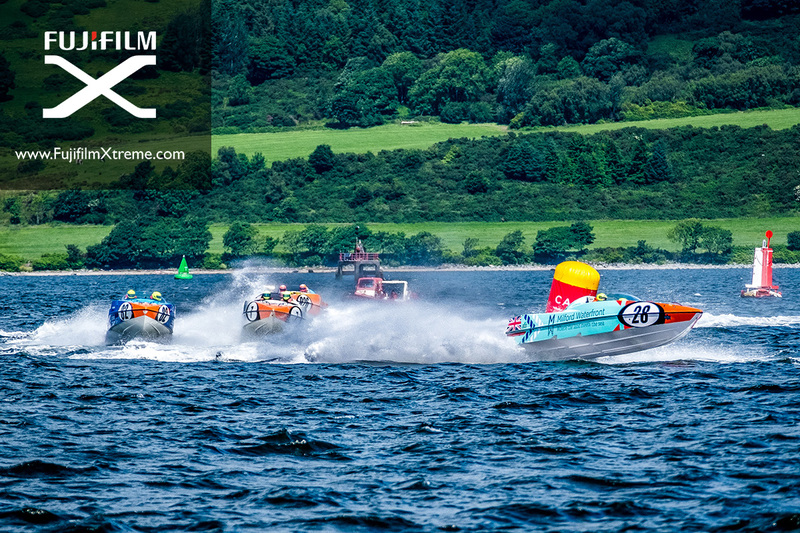 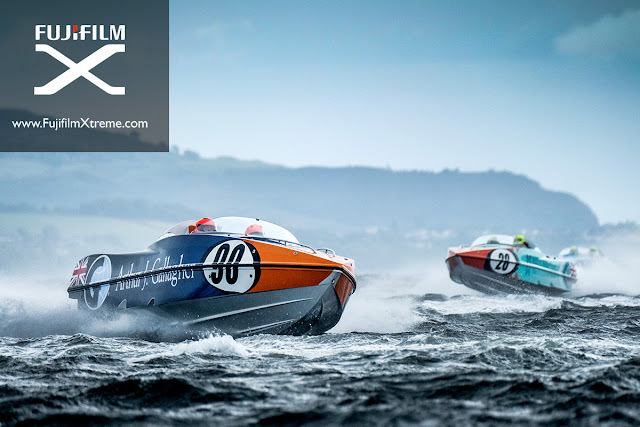 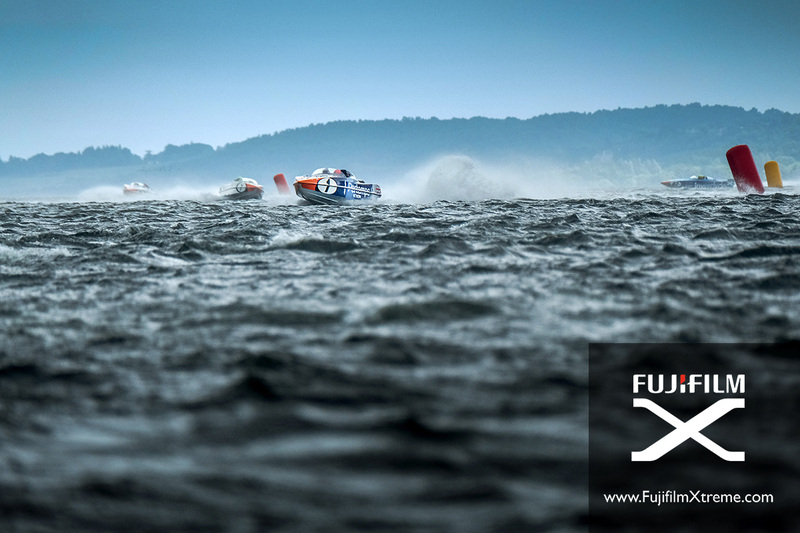 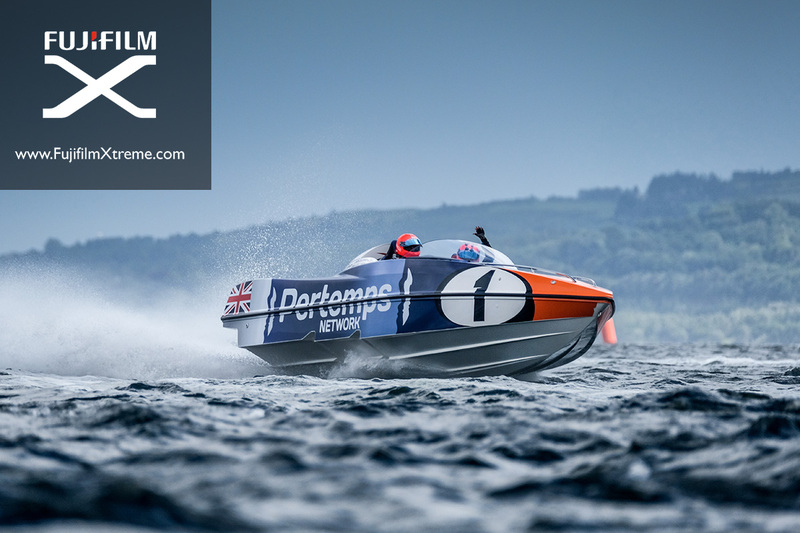 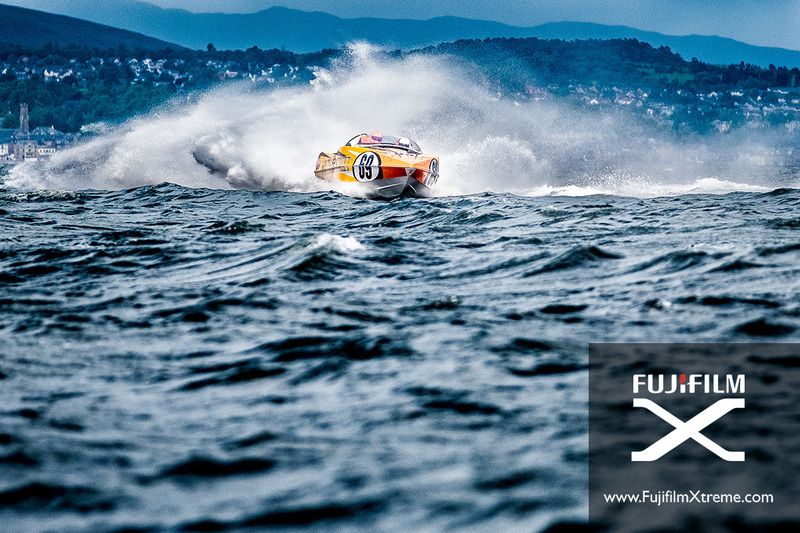 Powerboat racing is often associated with speed, action and glamour, so the choice for the first sport to be covered for Fujifilm X-Treme wasn't a hard one to make. 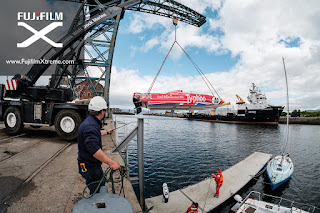 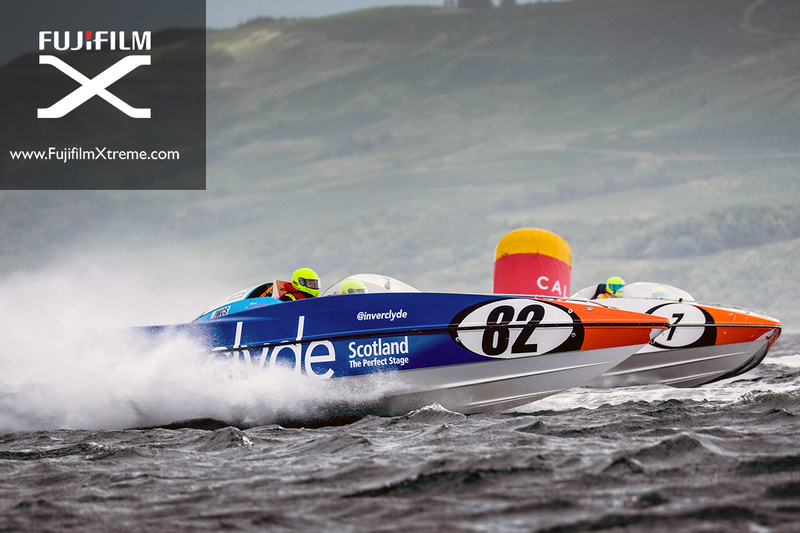 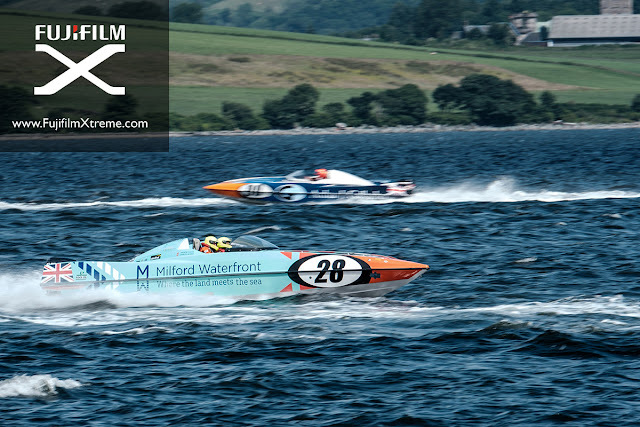 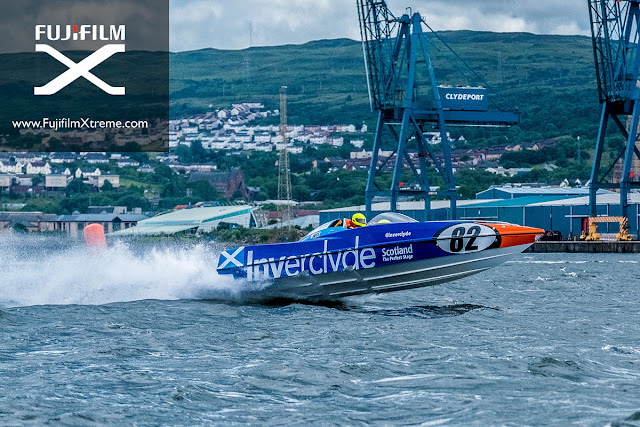 The P1 SuperStock series is one of the longest standing powerboat championships in the world and the event in Greenock in Scotland would mark the 500th race since it all began in 2003. A few weeks ago we caught up with one of the teams taking part in their first season of P1 for there preseason test in Musselburgh near Edinburgh (CLICK HERE). 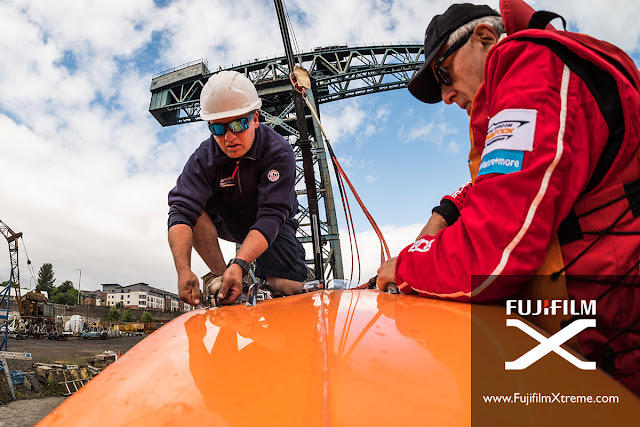 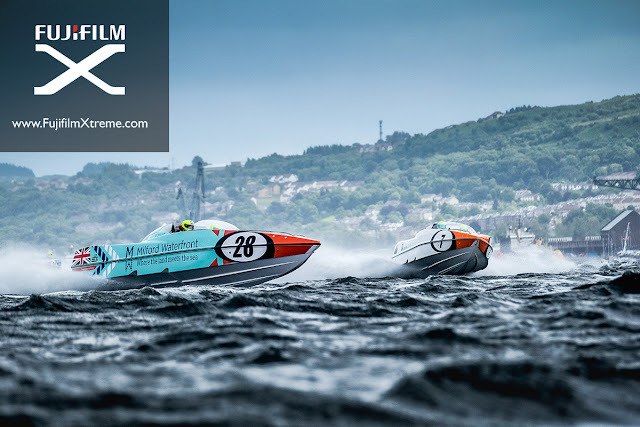 Father and daughter team Davie and Ashleigh Finlayson would be racing the 'Spirit of Inverclyde' sponsored P1 Panther boat for the four race series in Denmark, Scotland, Wales and England. 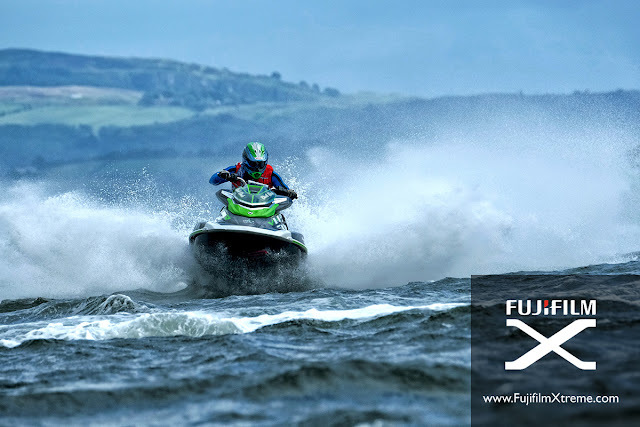 Round 1 was in Denmark and Fujifilm X-Treme went along to round 2 in Greenock on the Clyde estuary near Glasgow. 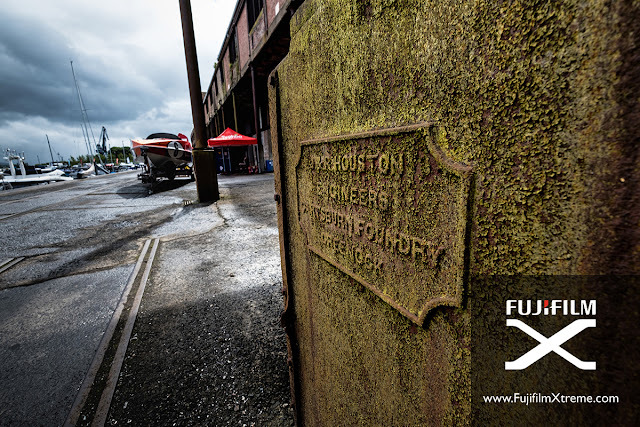 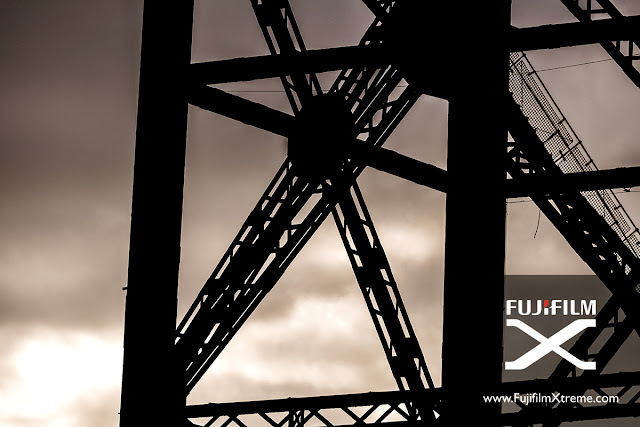 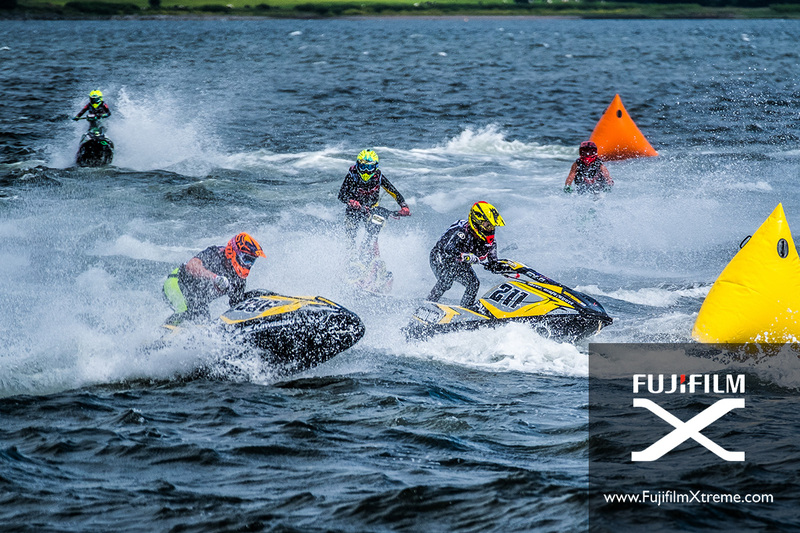 The Fujifilm X-Treme project is about testing the Fujifilm cameras and lenses to the max and this event provided plenty of opportunities to put the X-Series to the test. 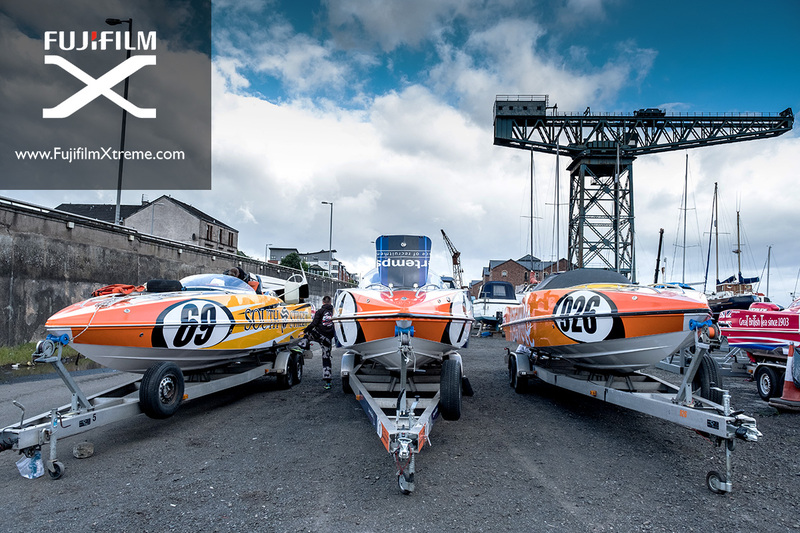 Day 1 started early as there was a 20-minute walk to James Watt Dock Marina where the P1 boats spent the night out of the water. 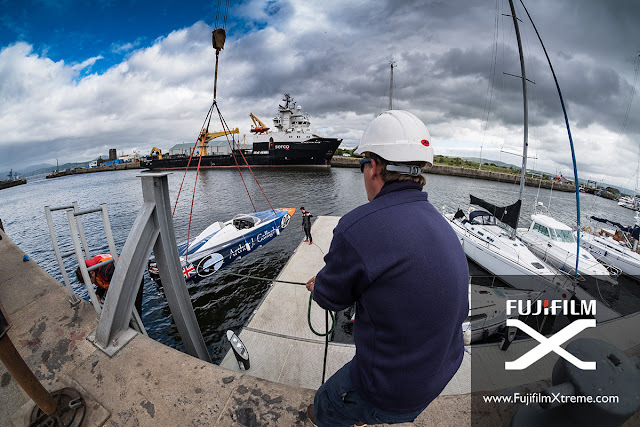 A set of images of the boats going into the water were captured on the X-Pro2 and the XF10-24mm or the Samyang 8mm f2.8 fisheye. 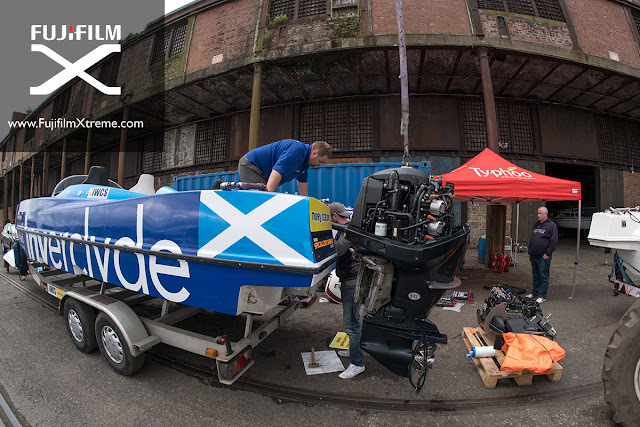 The 'Spirit of Inverclyde' was hauled out of the water when an engine mount had to be repaired in the pouring rain on the side of the dock. This meant the Finlayson duo had to miss the practice session but they did get out on the water for the first race. 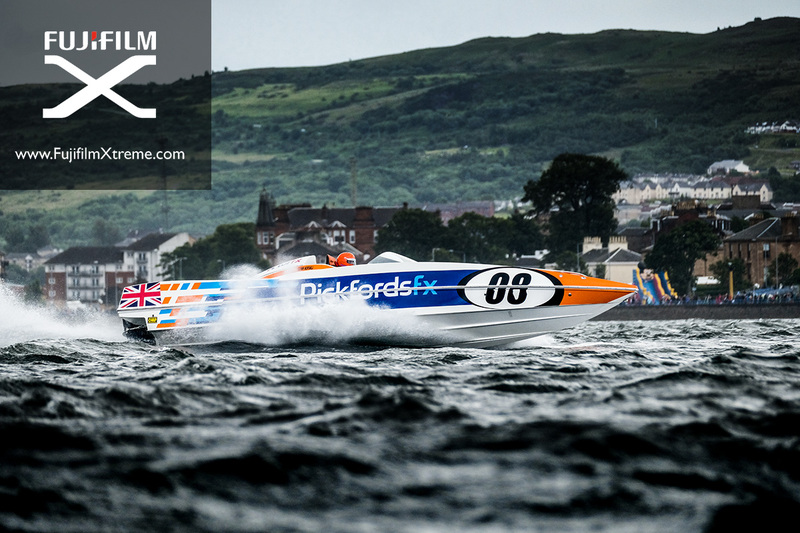 Jeff Carter then headed down to the marina to catch a RIB which he would be using with two other members of the media for the two races. Because he was going to be shooting from an open boat Jeff took three camera bodies (2 x XT-2 + 1 x X-Pro2) and three lenses (XF100-400mm, XF50-140mm and XF10-24mm) so he wouldn't have to change lenses in the difficult conditions. He also stuffed the pockets of his wet weather gear with spare batteries, a shammy leather, lens cloths and the 1.4x converter, leaving his camera bag on shore safe and dry. 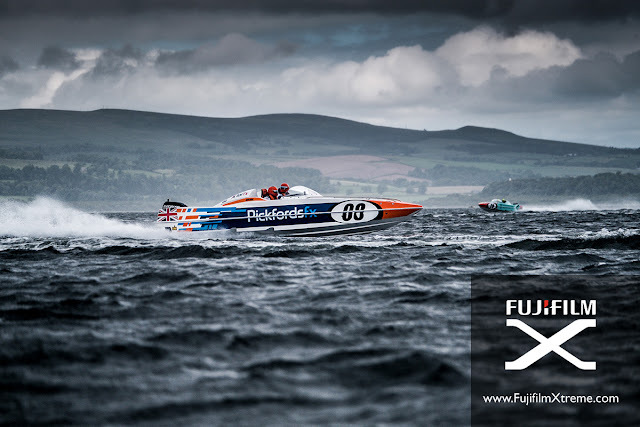 The short trip up the coast to the small dock at the end of The Esplanade where the race course was set took a short 10-minutes but just as the RIB coasted into the harbour the engine cut out and refused to start. Things looked bleak and it looked like we would be standing on dry land for the two races but luckily the James Watt Dock Marina crew came to our rescue and offered us a place on their RIB, which was acting as a support boat for the event. 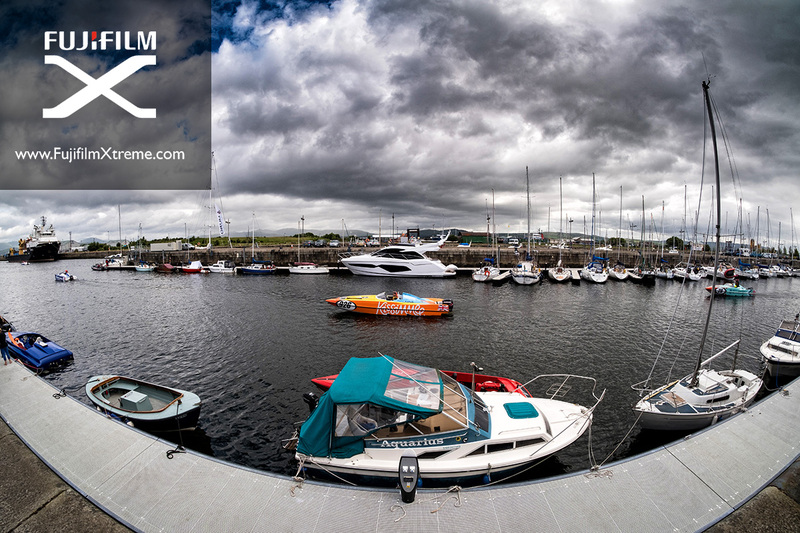 The rain was sweeping in from the west, driven on by high winds. 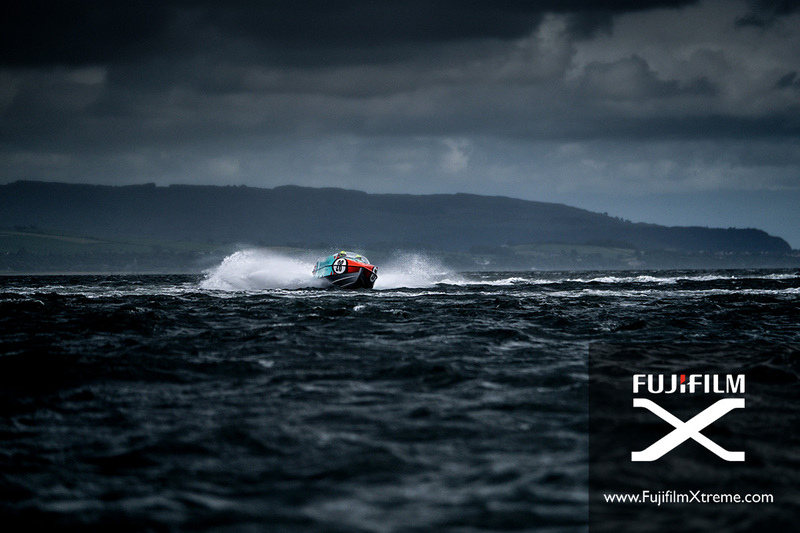 The wind, coupled with a strong tide, made the conditions on the water very choppy to say the least. 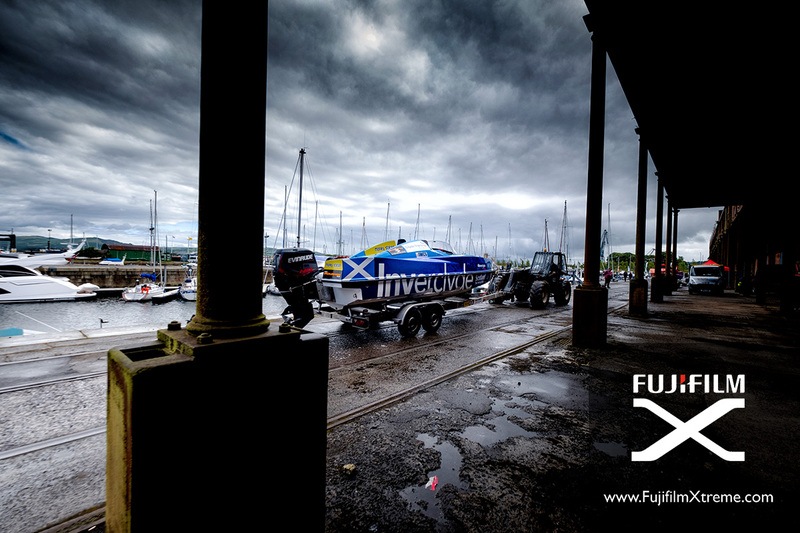 With the weather fronts being driven through quickly it meant that the sun did make an appearance, spotlighting the boats against a very dark and moody sky, making for some epic images - very Fujifilm X-Treme! 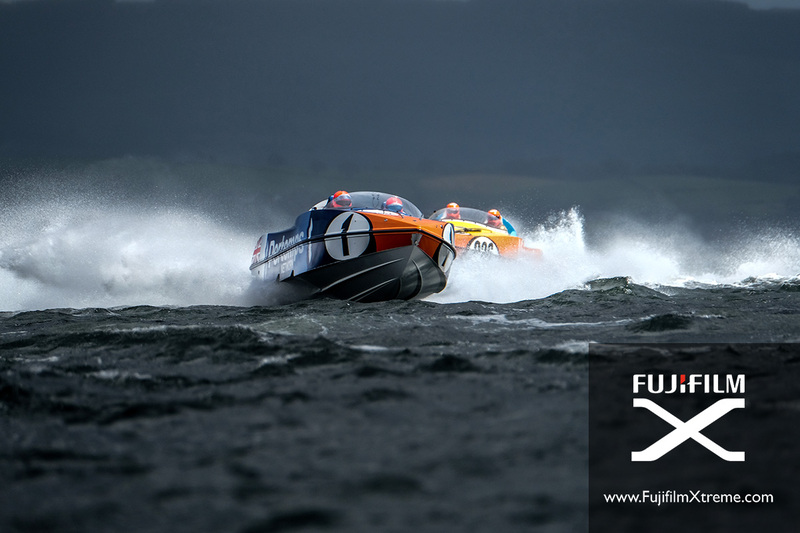 With the boat moving around on the choppy water it made focusing on the approaching P1 Panthers very difficult, especially at the long end of the XF100-400mm. 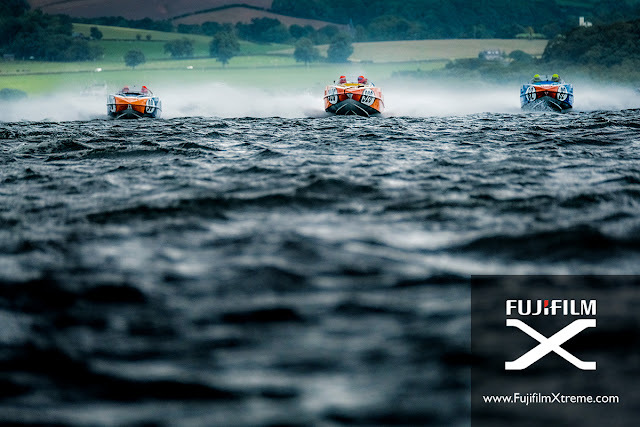 If you have ever shot from a moving boat you will know the type of conditions and most sequence of shots were subject-sky-subject-water-subject as the RIB bobbed about. The RIB would also swing around in the wind and current, usually just as a good shot had been lined up. It was very frustrating! Using a high shutter speed to freeze the action was the order of the day with most shots taken at 1/1600s or higher so when the RIB was level there was more chance of getting the boat sharp. 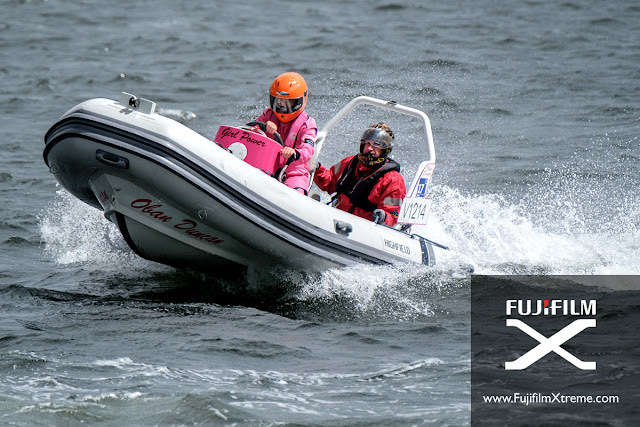 Some panning shots were taken when the RIB was heading up wind and was more stable, with a shutter speed of 1/125s the slowest usable speed due to the vertical movement in the RIB and in the subject. 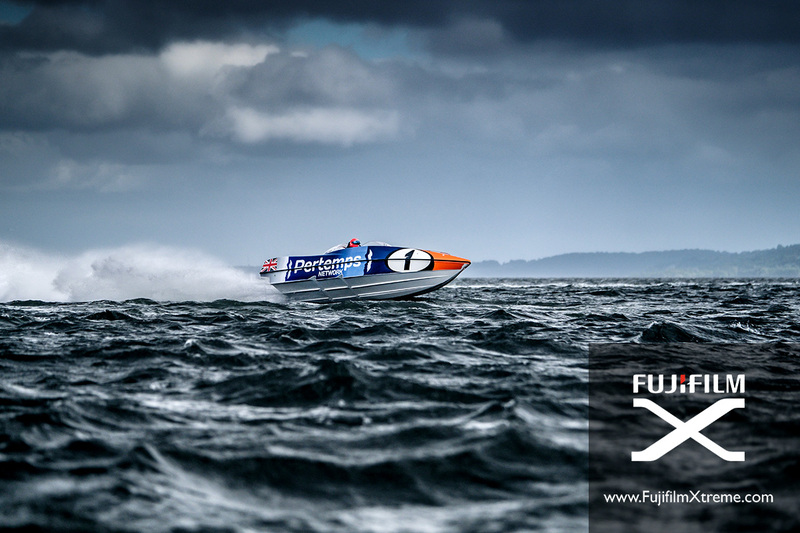 Another challenge was the spray from the waves crashing over the boat. Sea water and cameras are not a good combination which is why I had a shammy leather to mop off the excess water and keep the front elements of the lenses clear, though the long lens hoods on the 100-400mm and 50-140mm kept the front elements pretty clear of spray. 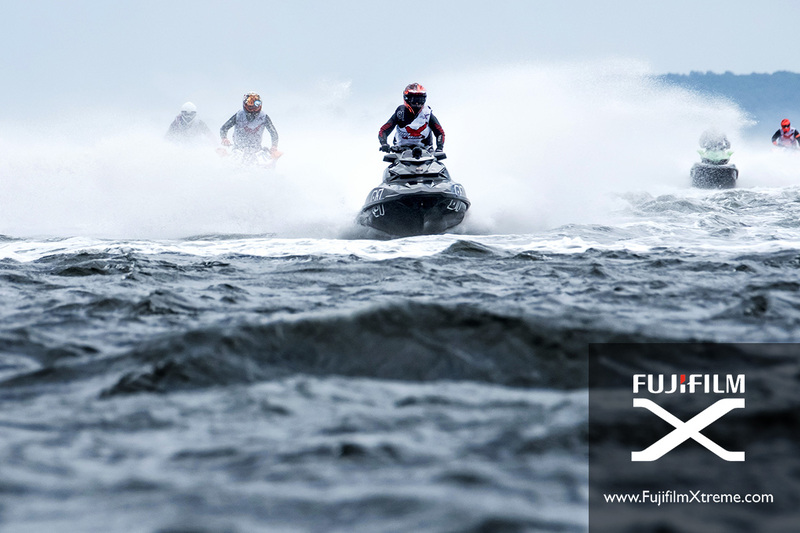 While I was shooting I didn't cover the cameras up and all three camera bodies worked for the three hours we were on the water. 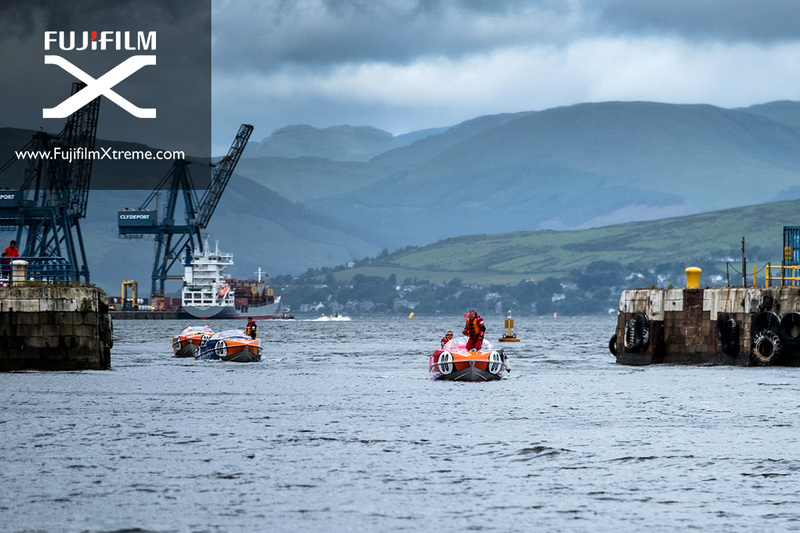 The other photographer in the boat was shooting on a pair of Canon 1D MKIVs and both the cameras stopped working before the end of the first race due to water ingress. 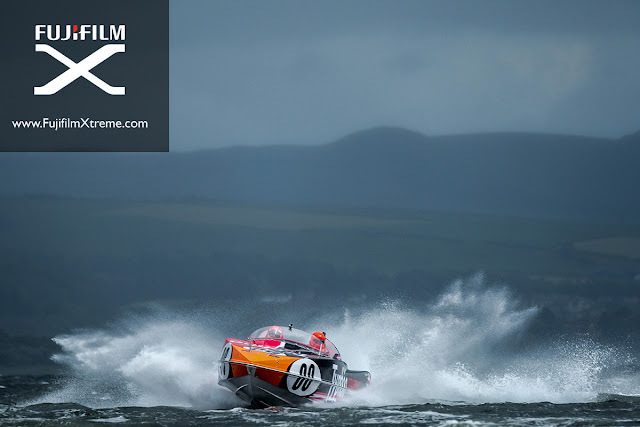 He was able to dry the cameras out overnight but it did cause a few issues for the second race of the day. 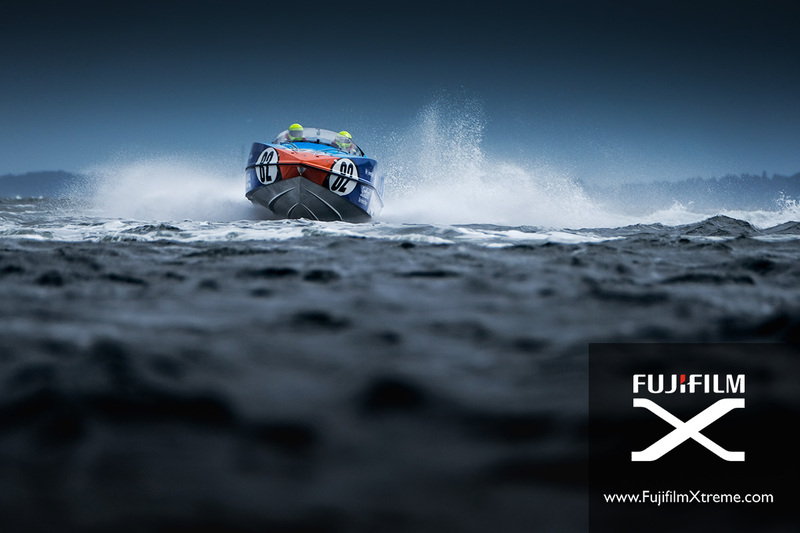 A big plus point for Fujifilm! 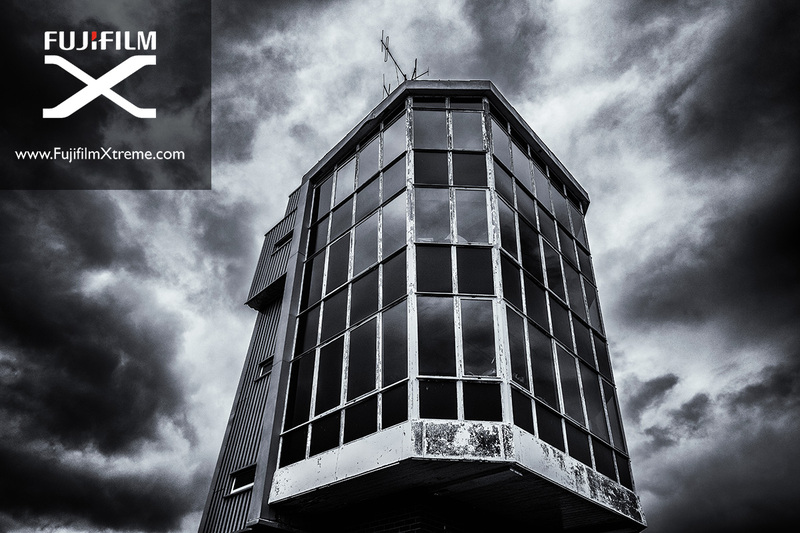 The weather resistance of the cameras and lenses is really good! And bear in mind the 10-24mm fitted to the X-Pro2 is not a WR lens, but then again it didn't get much use while out of the water favouring the two X-T2s and the 50-140mm and 100-400mm telephoto zooms. After shooting the AquaX and the second P1 Superstock races, we headed back to the small dock on The Esplanade and back to dry land. The cameras and lenses were soaked, as was the photographer despite the wet weather gear. But the cameras didn't falter once while out on the water. The weather on day two was certainly an improvement on the previous day but with a strong wind blowing the water was still very rough. The morning was spent on dry land with both John and Jeff shooting the support races, capturing some detailed shots of the action and stunts from the jet skiers. 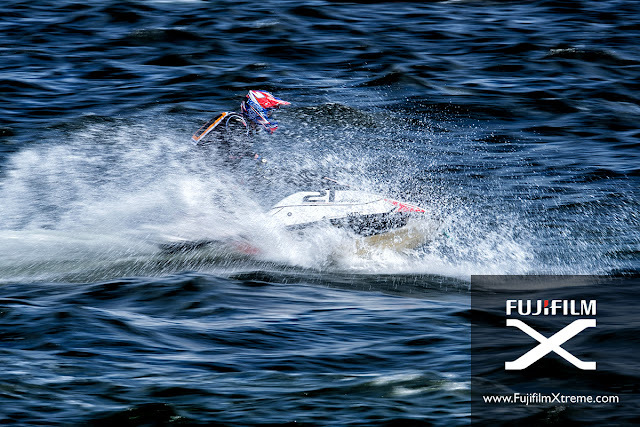 Action freezing shutter speeds were used by both with John favouring 1/4000s to 1/8000s with Jeff coming down to 1/1000 to 1/2000s with a lower ISO. 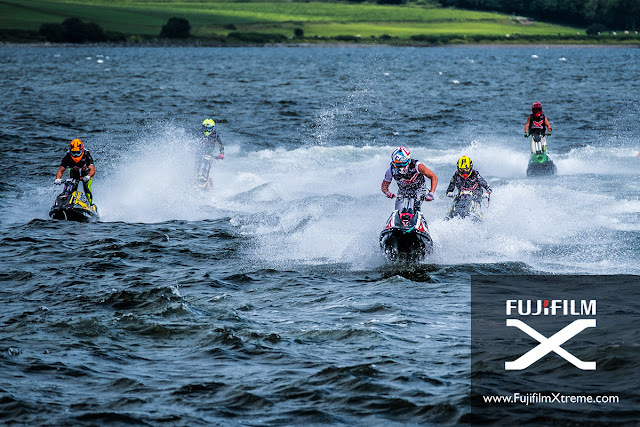 For panning shots from The Esplanade shutter speeds of between 1/20 and 1/40 were used by both John and Jeff to give plenty of blur in the riders and the water, giving a real sense of action and speed. 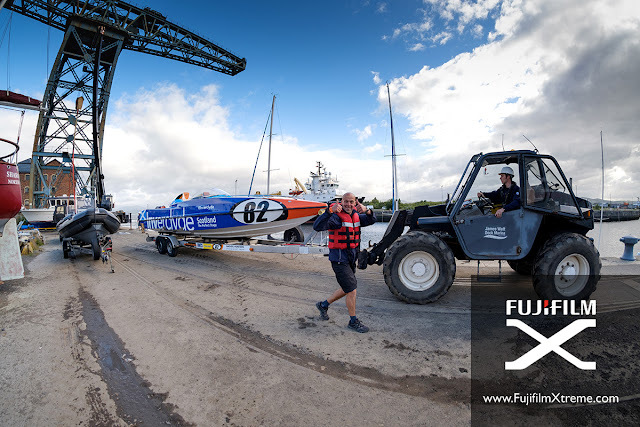 In the afternoon John was out on the water, however his trip out on the support boat was cut short when two of the P1 Panthers collided in the final race of the day and the no69 boat had to be towed back to James Watt Dock Marina. The boat John was on was used to tow the stricken P1 back and by the time they got back on station they were out of position. However it was not all bad news as some of his best shots from the P1 race where when the teams had to do their Pit laps, as this brought them much closer to the safety boat.Â The safety boat was also much more stable than the RIB used on the previous day. 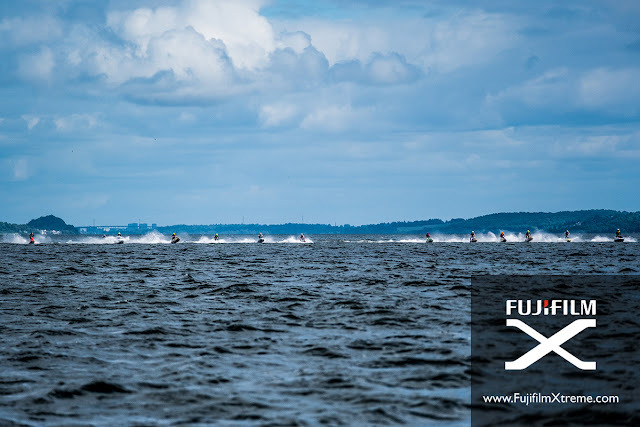 Jeff's position on dry land produced some nice shots as the waves being kicked up by the tide and the boats meant the P1s were getting some big air coming out of the turn nearest to The Esplanade. 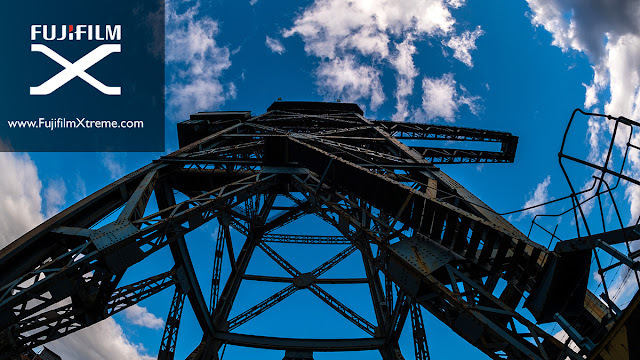 The only issue was no matter where you stood on the shoreline the images started to look very similar because the angles were pretty much the same. 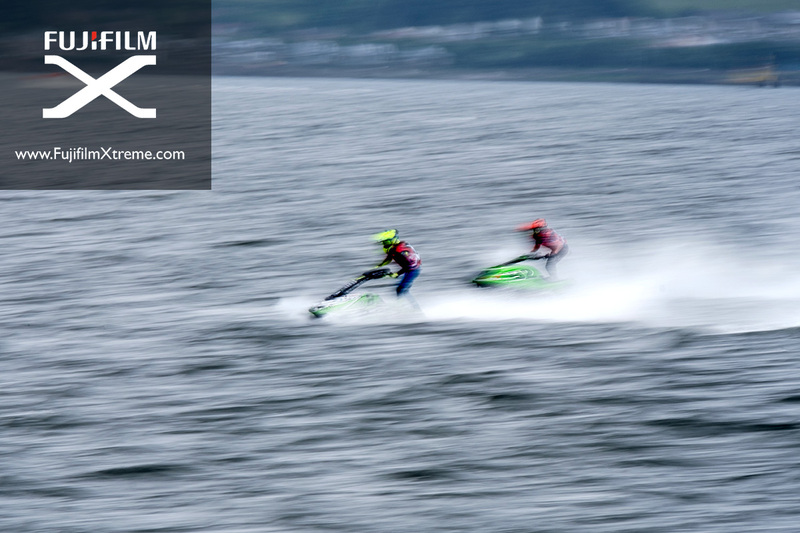 Slow panning at 1/25s provided some variety before the end of the last race of the day. 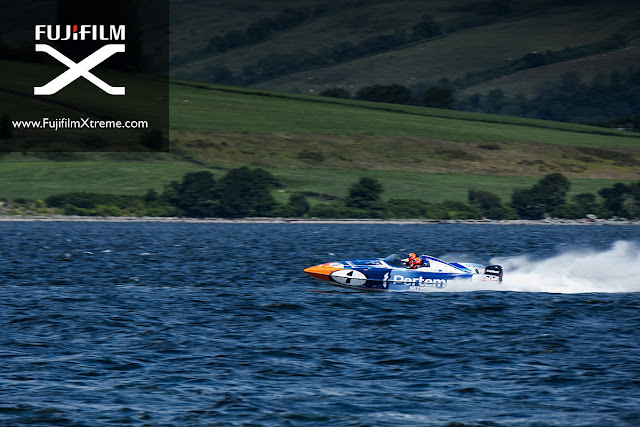 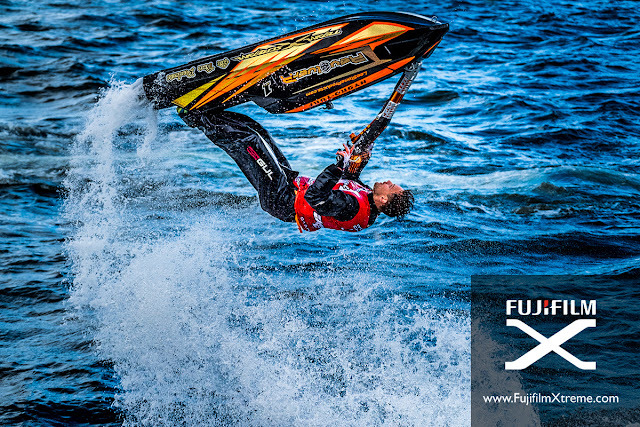 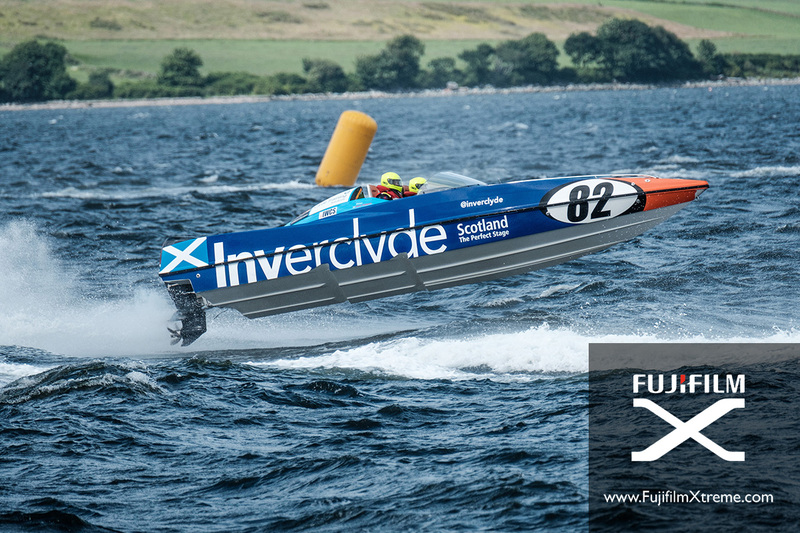 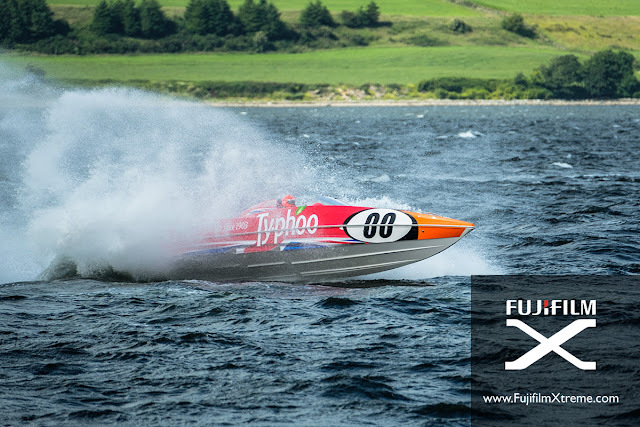 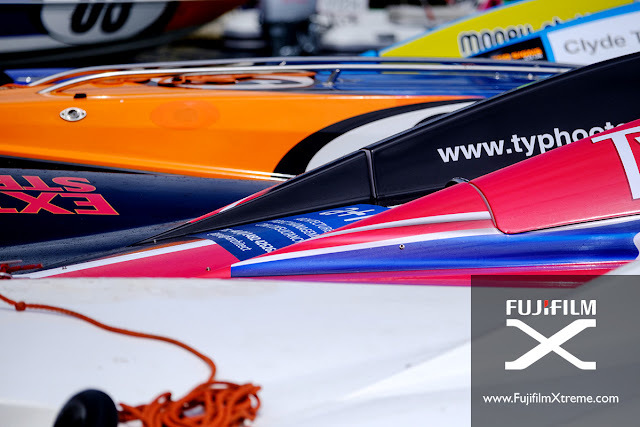 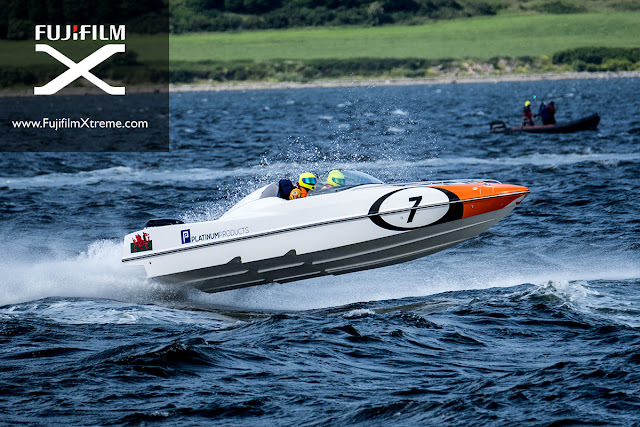 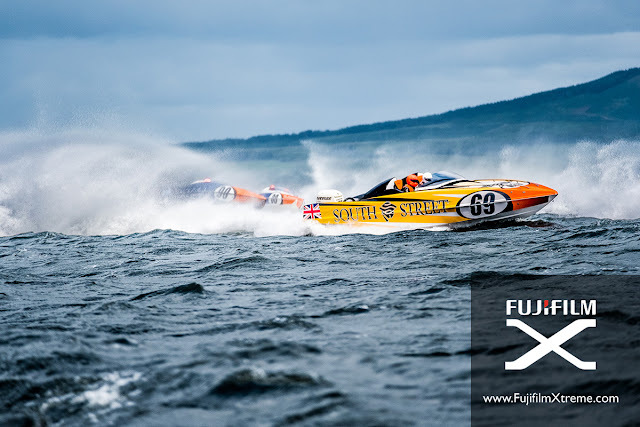 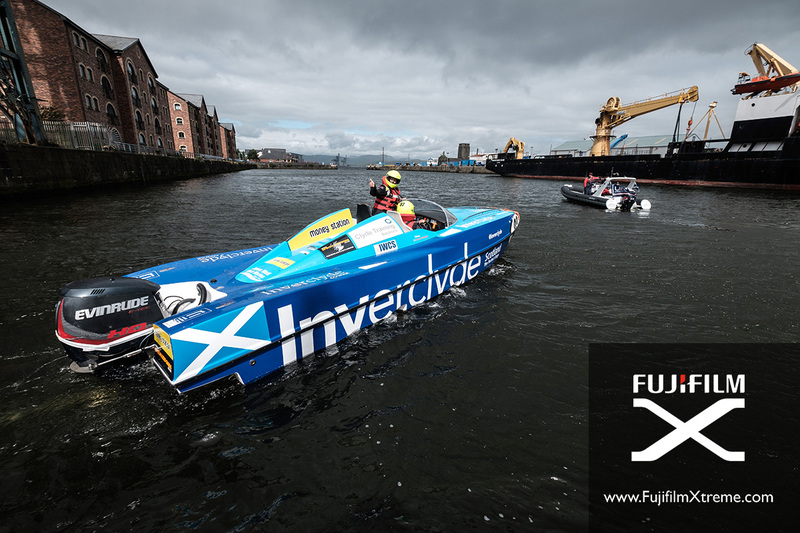 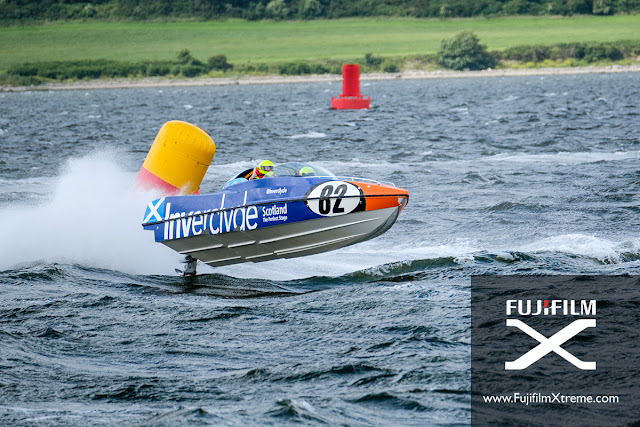 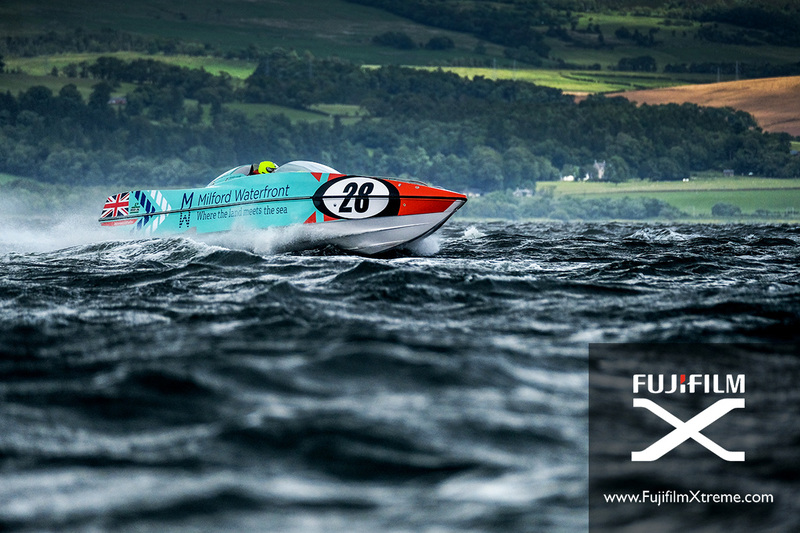 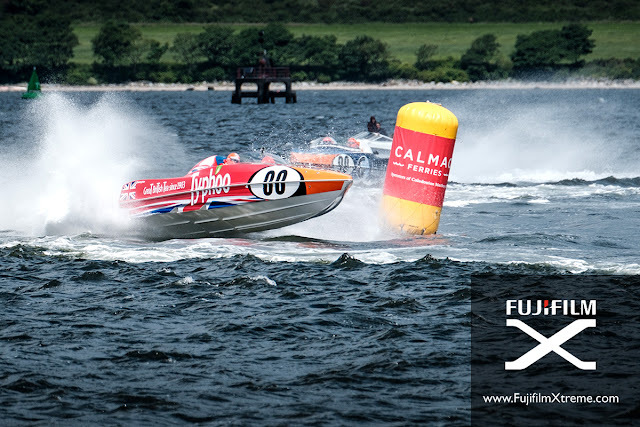 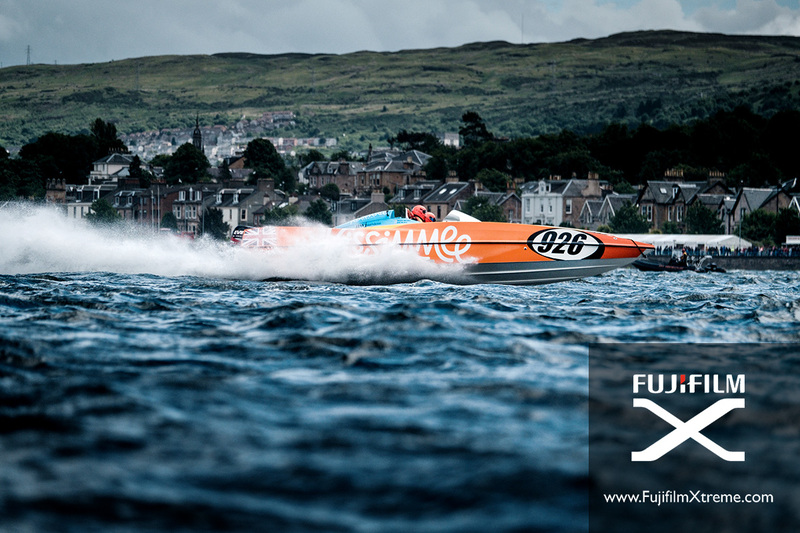 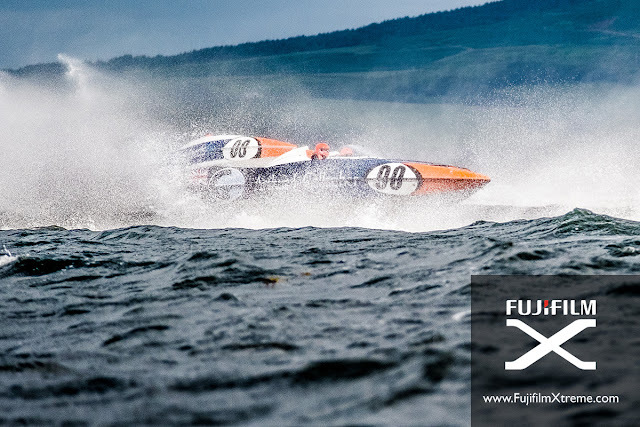 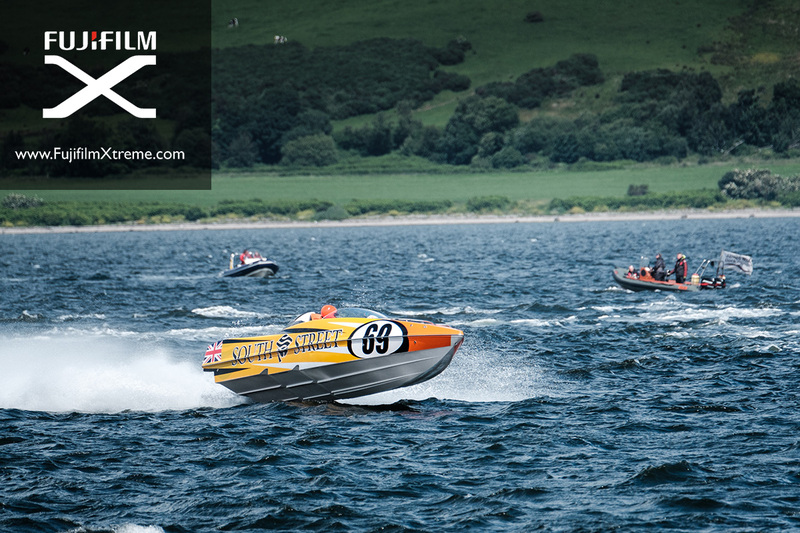 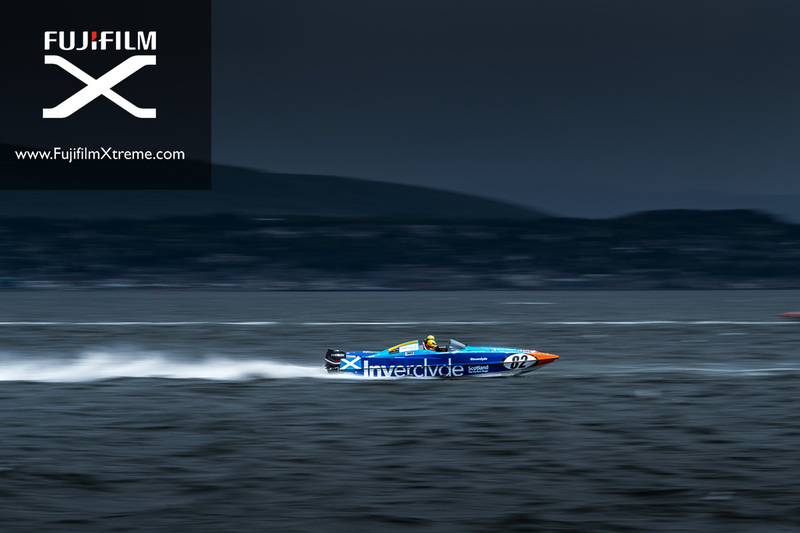 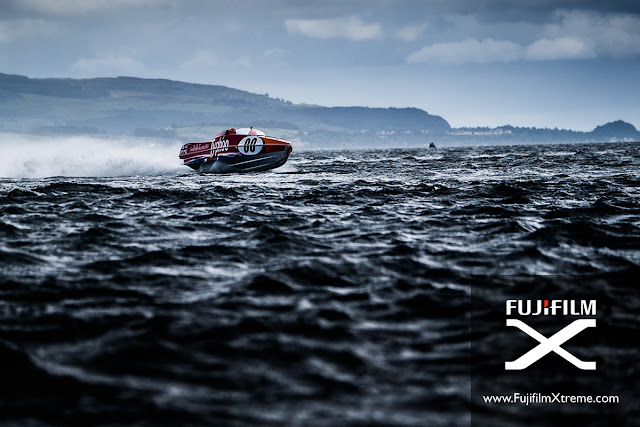 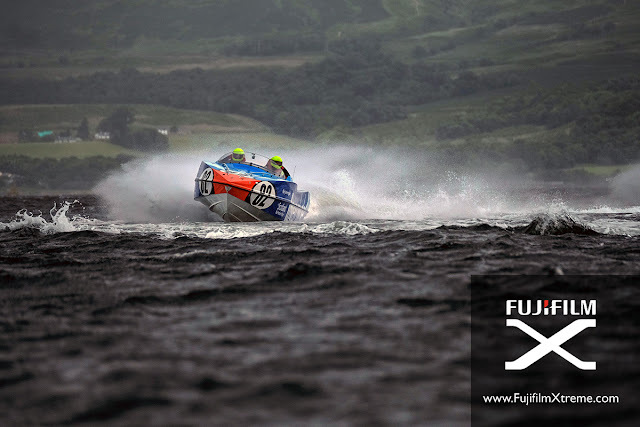 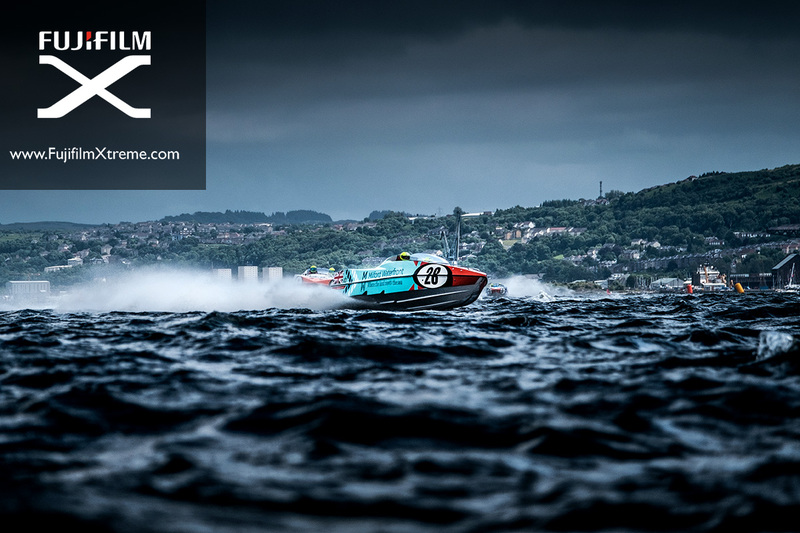 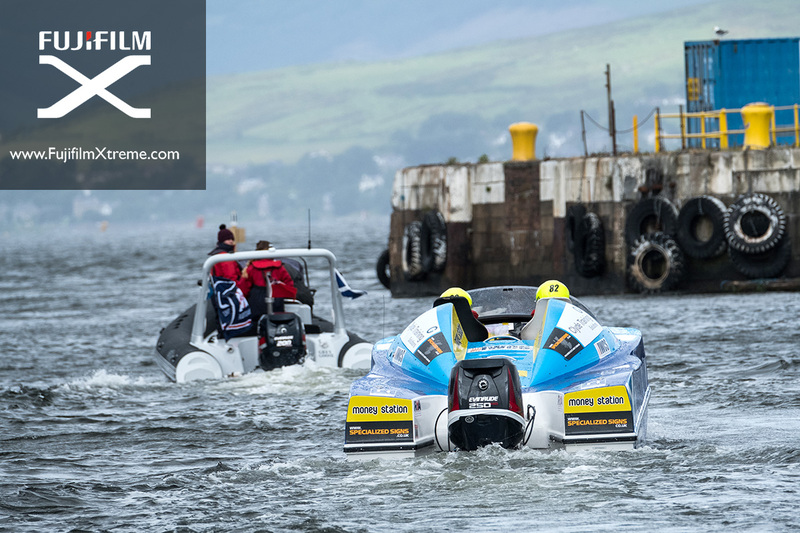 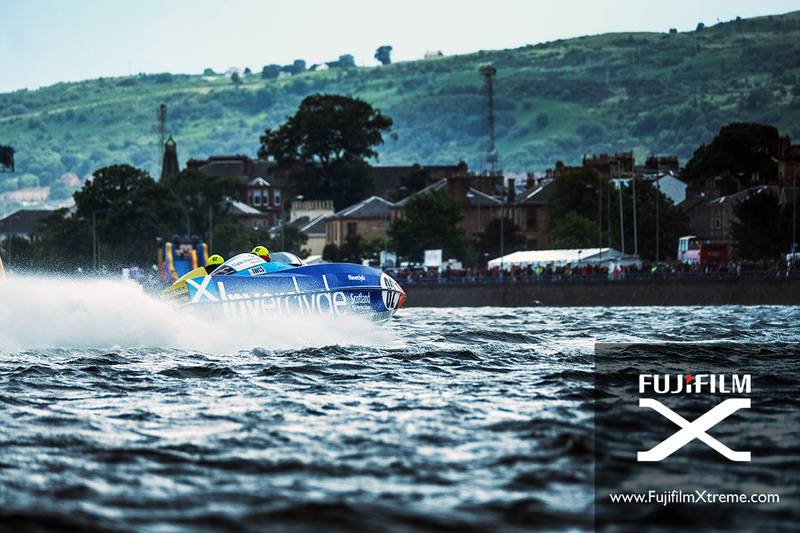 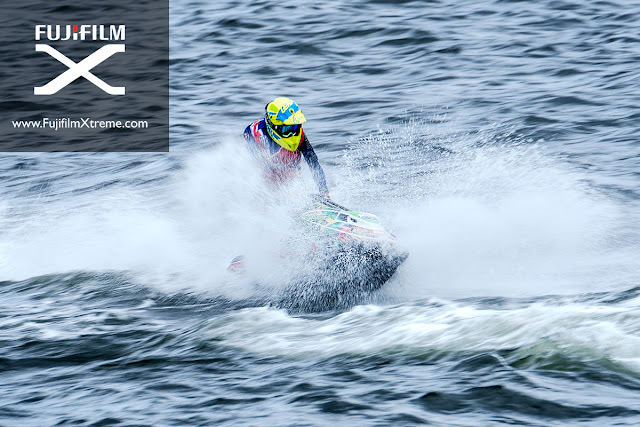 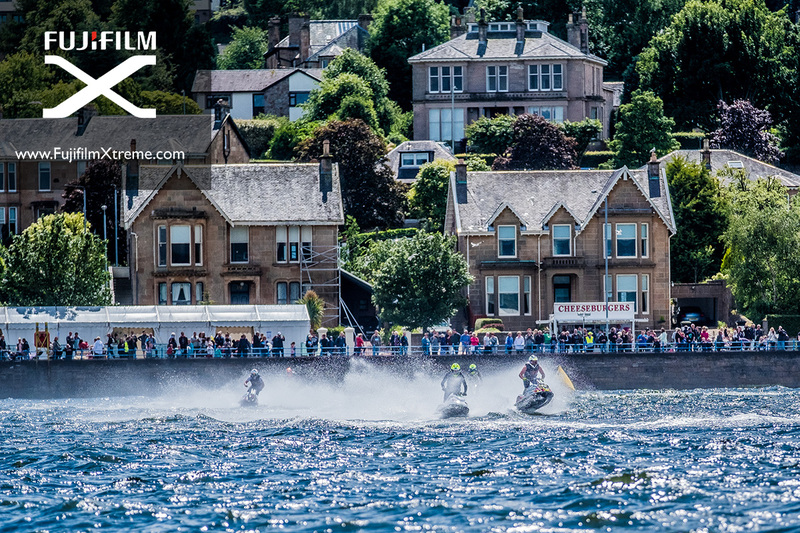 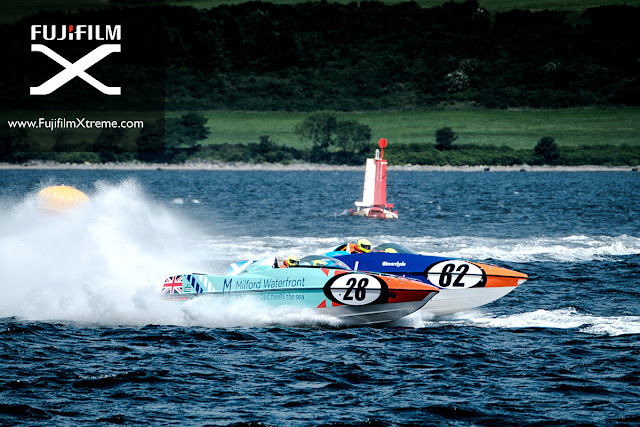 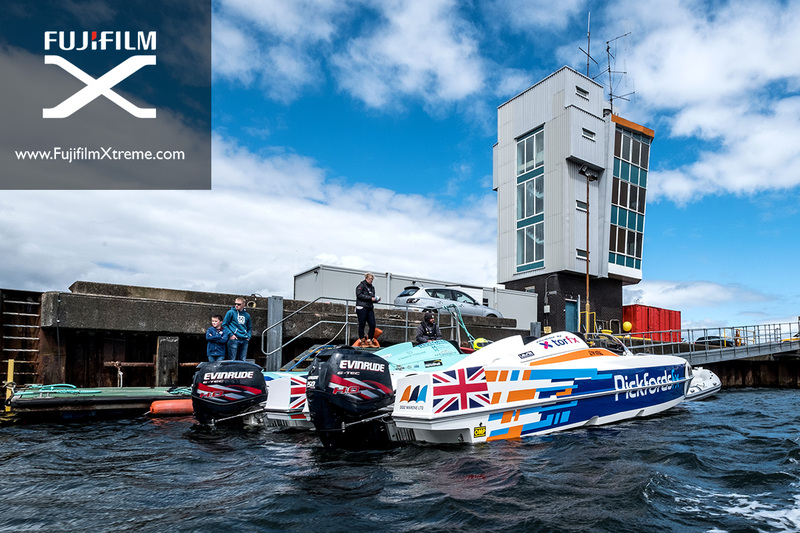 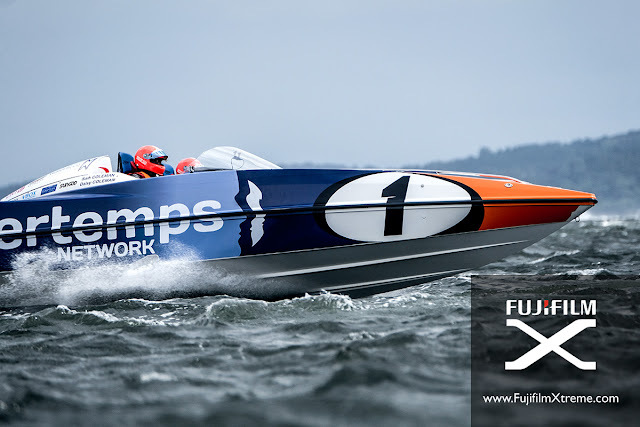 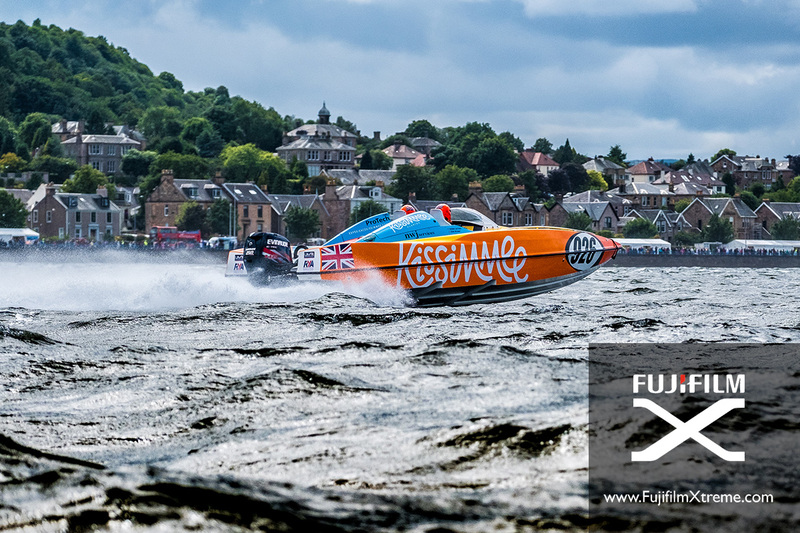 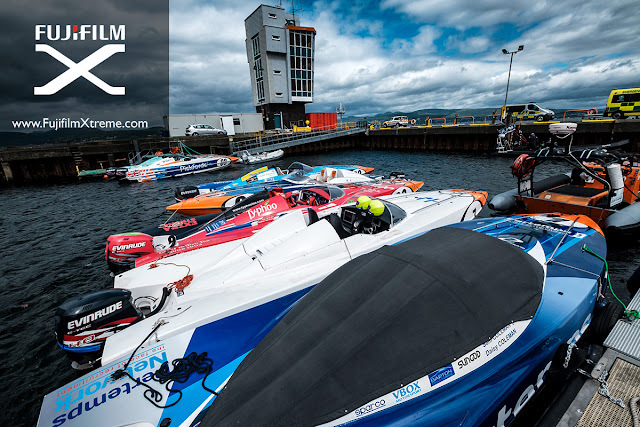 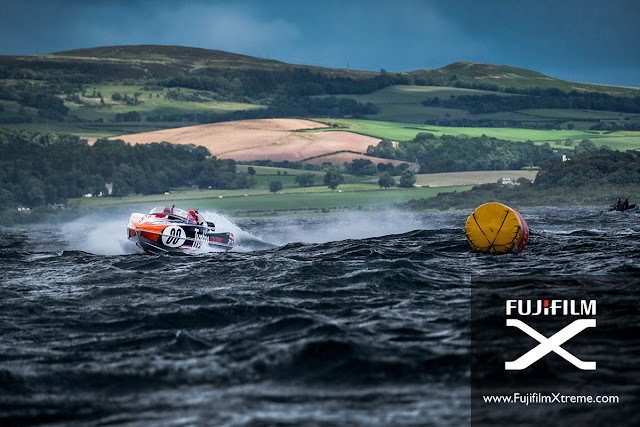 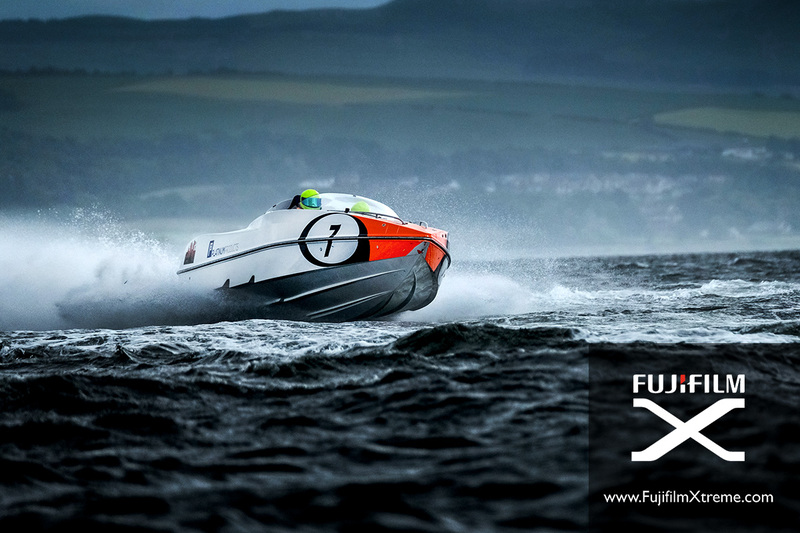 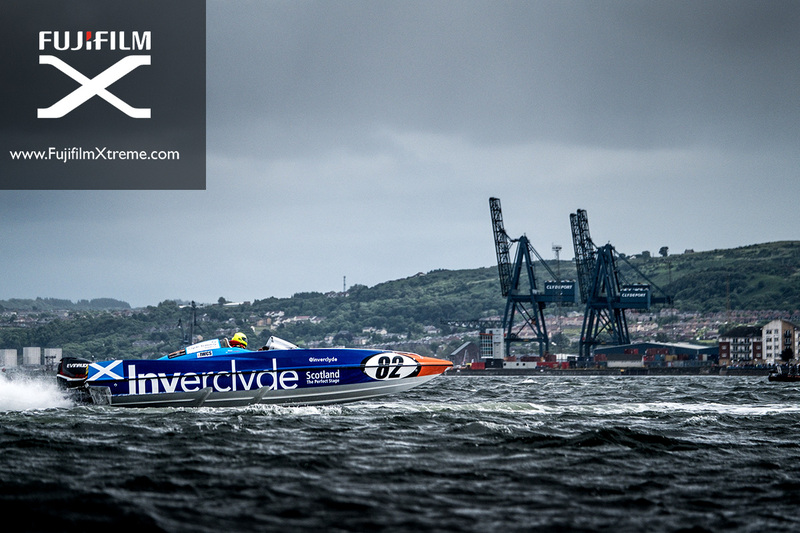 The P1 Scottish Grand Prix of the Sea provided the perfect event for the first Fujifilm X-Treme test. 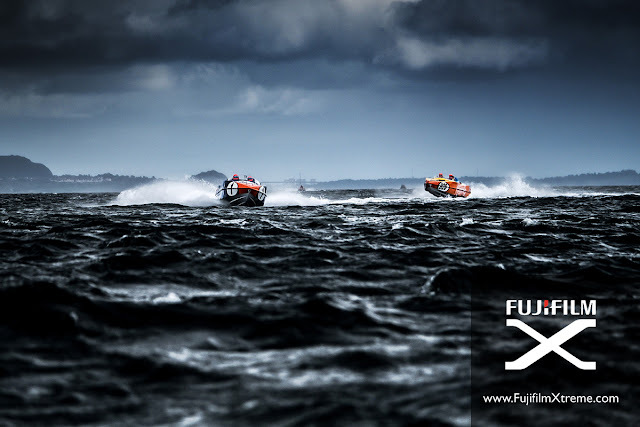 The stormy conditions out on the sea meant the weather proofing of the X-Series was put to a stern test and the cameras didn't miss a beat. 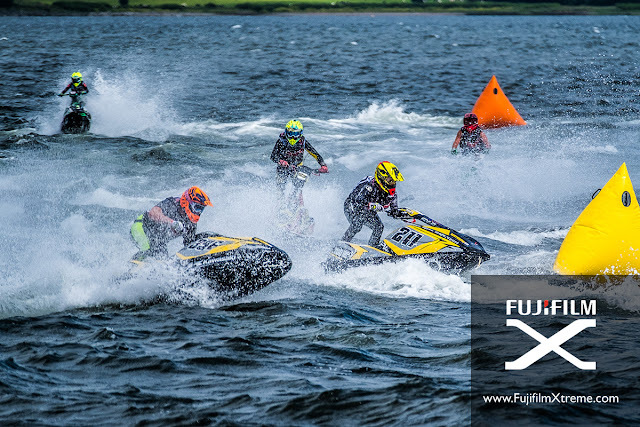 The event also provided another sporting arena where the X-Series has been proven to be capable of cutting it with the very best from the other camera manufacturers. Telephoto Zoom - 100-400mm f4.5/5.6 (with an option to fit a 1.4x converter for extra pulling power) or 50-140mm f2.8 with a 2x converter for frame filling images. 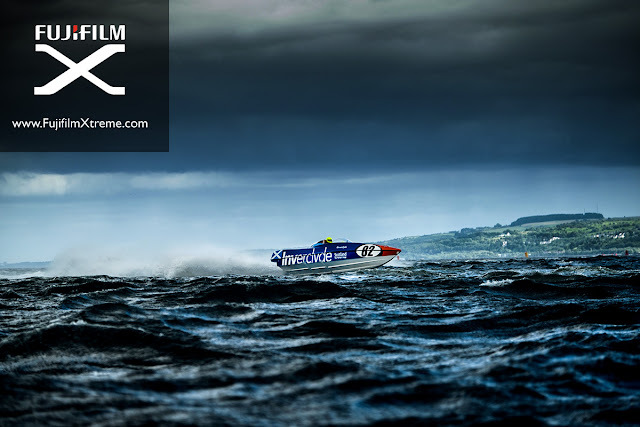 Standard zoom - 16-55mm f2.8 for wide action shots and behind the scenes images. Ultra Wide Zoom - 10-24mm f4 wide angle zoom lens is useful a different track shot or a close in pits image. Optical Image Stabilisation (OIS) on. 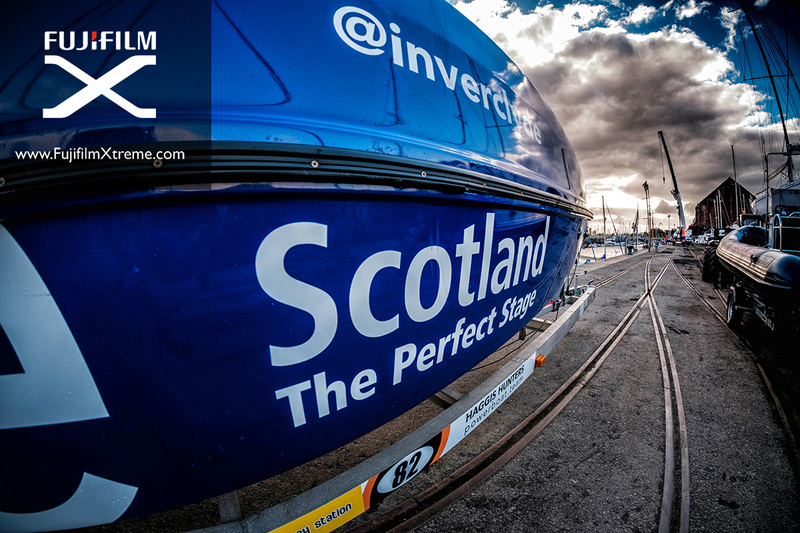 Metering set to Centre Weighted. 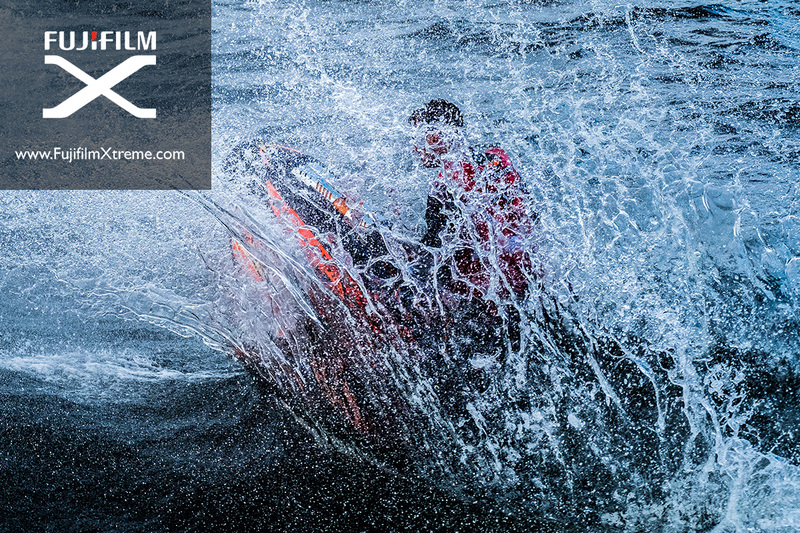 Autofocus - AF-C with camera set to 'boost' to improve reaction time. Action freezing images - minimum 1/1000s with aperture wide open. 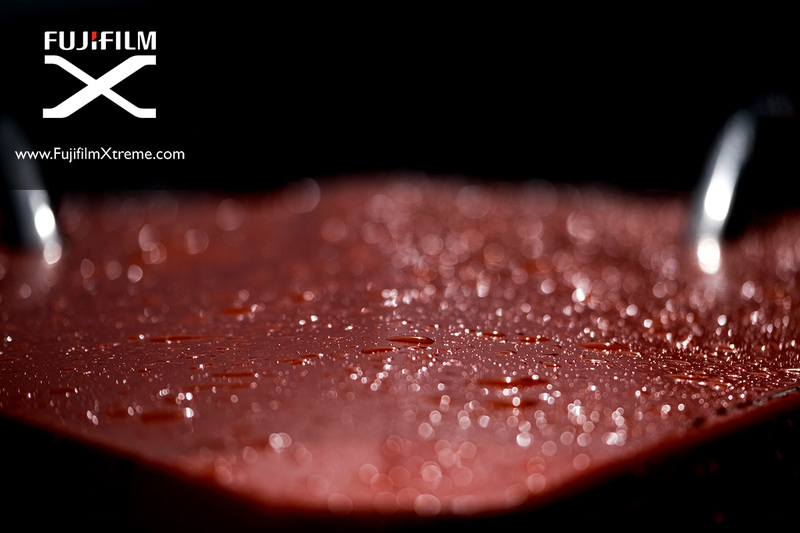 Adjust ISO accordingly. 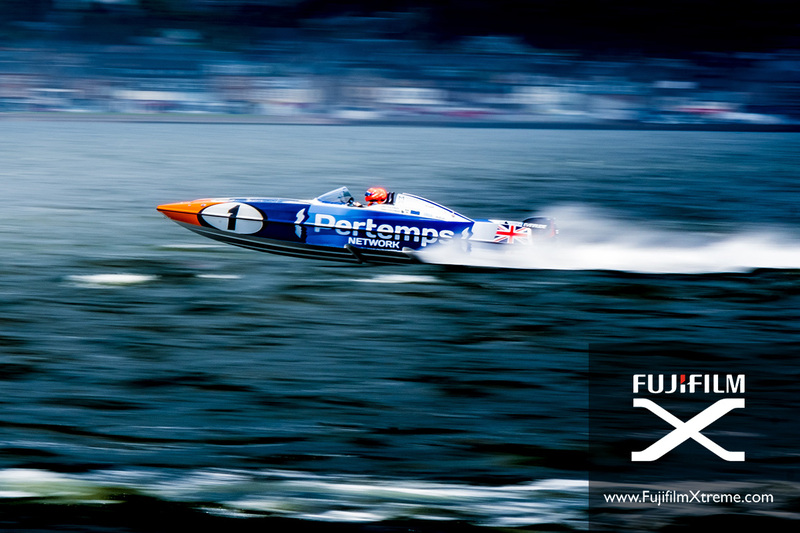 Panning images - 1/125s or 1/60s choose a suitable aperture and drop the ISO down to 200/400.